Sleek One bedroom/Studios on the lake. Newly renovated for Memorial Day 2015. 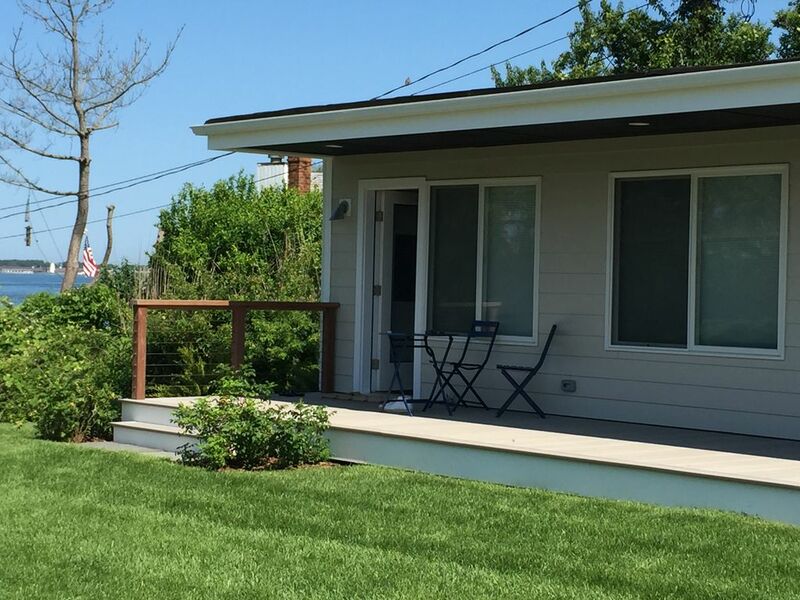 Recently renovated, this unit we call Gin Beach provides a relaxing retreat on Lake Montauk. Gin Beach comes equipped with a full kitchen, washer/dryer, linens, towels, large screen TVs, air conditioning throughout bedroom and living room area, access to private lake beach as well as kayaks and paddle boards to enjoy a summer on the water! Dine outside on outdoor deck space complete with gas grill and seating. Guests can enjoy a common seating area and fire pit near the lake. Gin Beach is one of four units on the property. Please note that this unit has a grass path from the parking spot to the deck and there is one step up to the deck. 71 East Lake Drive is situated on lovely Lake Montauk. Enjoy paddling and kayaking on the lake during the day and savor summer sunsets in the evening. Deck with bistro set outside unit. The place was very comfortable, neat and clean. It is perfectly located. -- Close to the beach, main Street, and lighthouse museum. We enjoyed our stayed and would consider staying here again next time we come back. My girlfriend and I booked this last minute trip just to get away for a couple of days. It has everything you need in a great location just a few miles away from the village. Incredible views all around in a peaceful setting. The homeowners are most accommodating and professional. We plan to do a bigger family trip back here over the summer. Thank you for having us! Now that we have found Duffy's we will never stay at another overpriced motel again! The property is beautiful and well maintained (we love sitting in the Adirondack chairs and having a fire). We have stayed in the Studio and the 1 bedroom and both are spotless! They also have everything you would need, are beautifully decorated and comfortable. Kelly and Rick are amazing hosts! We can't wait to come back! neat, clean, new, well appointed. Comfortable and efficient. Positioning of the unit on the property vis-a-vis owner's house, nearby highway, and other units not clear from the listing. However, we had a good time and the hosts clearing understand the user experience in a VRBO situation.